Reducing trade costs is essential for economies to effectively use trade as an engine of growth and sustainable development. Trade facilitation plays a pivotal role in reducing trade costs, on top of existing efforts to dismantle tariff and non-tariff barriers and enhance physical connectivity. In the Asia-Pacific Trade and Investment Report 2017, the United Nations Economic and Social Commission for Asia and the Pacific found that moderate region-wide improvements in trade facilitation in Asia-Pacific could lift GDP by 0.32 per cent annually between 2015 and 2030, which is equivalent to nearly $87 billion per year – 14 times more than under the tariff liberalization scenario considered in the same study. In addition, if bigger and more ambitious steps are made by putting all the Asia-Pacific region’s trade-related paperwork online (digital trade facilitation) could slash the time it takes to export goods by up to 44 per cent, cut the cost of doing so by up to 31 per cent, and boost exports by as much as $257 billion a year. Framework Agreement on Facilitation of Cross-border Paperless Trade in Asia and the Pacific (FA-CPT). Trade facilitation has been a longstanding item on the agenda of the Asia-Pacific Economic Cooperation (APEC). APEC defines trade facilitation in terms of reducing trade transaction costs, as stated in the Trade Facilitation Action Plan (TFAP) Initiative. APEC members have also fully supported the implementation of WTO TFA – with an implementation rate of 92.6 per cent based on notifications to the WTO. In addition, as single window is one of the key initiatives under APEC, member economies have started to explore the issue of its International Interoperability. •	APEC members’ aggregate implementation rate of the measures stood at 75 per cent, above the global average at 60 per cent. Among APEC members, Australia and Singapore had the highest implementation rate over 90 per cent. •	APEC members have made good progress. 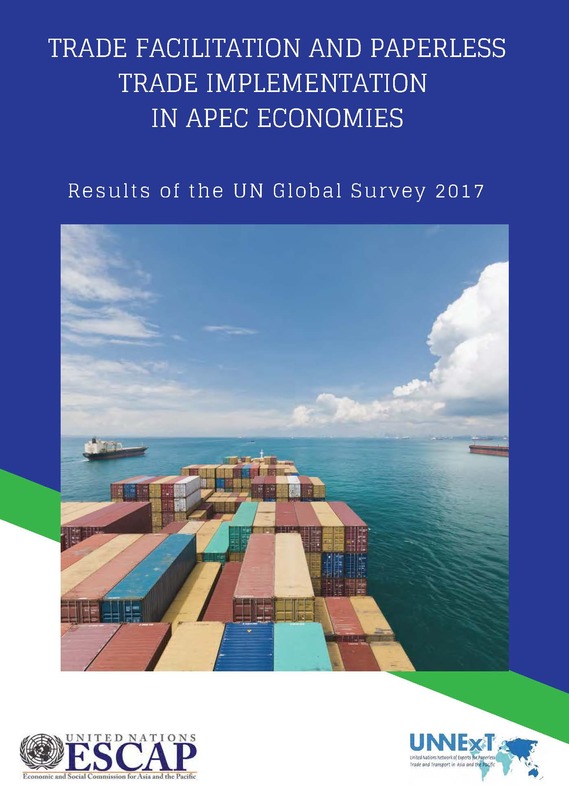 Implementation rate of APEC as a group improved from 69 per cent to 75 per cent between the first and second Global Surveys conducted in 2015 and 2017. •	APEC members have well implemented trade facilitation measures related to Transparency and Formalities, and to a less extent on Institutional arrangement and cooperation and Cross-border paperless trade. •	APEC members have already implemented many of the WTO TFA related measures, in particular Transparency measures. However, Cross-border paperless trade implementation remained low and there is still significant room for improvement. •	Implementation of “inclusive” trade facilitation measures to promote SME and women participation in trade remained low and APEC members may further promote such measures in the context of the 2030 Sustainable Development Agenda. •	Full implementation of binding measures by APEC members will result in a decrease of trade cost by about 6 per cent, while full implementation of all measures would result in an over 10 per cent reduction. •	Implementation of TFA measures together with enabling the seamless electronic exchange of trade data and documents across borders would result in much larger trade costs reductions, over 20 per cent for APEC as a whole. Going forward, the APEC members shall continue efforts on trade facilitation and the digitalization of trade procedures. To do so, APEC members, who are also ESCAP members, are encouraged to actively participate in the Framework Agreement on Facilitation of Cross-Border Paperless Trade, to advance regional cross-border paperless trade through pilot projects, information sharing and coordinated adoption of international standards and implementation models.